The old rule of thumb suggesting that one should invest as much in his optic as his rifle has been known to bewilder many a shooter. Not the least of these are the wise folks who have laid down a moderate amount of cash and walked away with a scope as impressive as the Leupold VX-II. Knowing the trust a committed sportsman must have in his equipment, Leupold has built the entire VX-II line to be as rugged and reliable as possible. No serious hunter wants to gamble on his success with questionable equipment, and will pick reliability over flash every time. Leupold builds the VX-II line specifically to cater to this market. Real-world, user-friendly features that increase reliability and performance are the name of the game. These scopes are designed for hard field use, and to take everything that the harsh conditions of a lifetime of hunts can dish out. Historically one of Leupold’s most successful riflescope series, the VX-II line continues to deliver world-class performance at an attainable price. 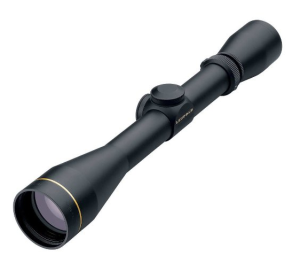 Out of the box, its 11.2 ounce weight places the deluxe-class VX-II as one of the lightest scopes in its category. Even so, the VX-II doesn’t skimp on toughness or features. The main tube is a two-piece unit, constructed of 6061-T6 aluminum, and filled with Leupold’s proprietary new Argon/Krypton gas blend. This gas provides excellent waterproofing and anti-fog characteristics superior to the older nitrogen gas one finds in many competing scopes. All of the glass is lead-free and coated on both sides with a special scratch-resistant DiamondCoat treatment. The VX-II is available in gloss black, matte black, and silver finishes. Only the matte black offers reticle options other than the standard Duplex, by giving the choice of Wide Duplex, German #4, Leupold Dot, and LR Duplex. Incorporating Leupold’s classic gold stripe and minimalist design, the VX-II 3-9x40mm is easy on the eyes in every way possible. In operation, the VX-II is equally slick. An update from previous versions, new finger-adjustable “click” turrets and a smooth-rolling, knurled power-adjustment knob make for easy adjustment in the field. Those turrets are now also resettable to zero and feature 1/4MOA adjustment increments. There’s an additional option for a custom laser-engraved CDS elevation turret, which provides customized adjustment matched to the ballistic profile of individual rifles, settings, and loads. The optical quality of the VX-II is typical of Leupold, with brilliant clarity and excellent light transmission. The edges of the sight picture are quite crisp and sharp, with no creeping fuzz or distortion. Throughout the magnification range, the reticle remains firmly centered in the scope; shooters don’t have to concern themselves with their zero shifting within the power range. Ocular focus can be individualized with a finger-adjustable knob, and set in place with a textured locking ring. The one-inch main tube and 40-millimeter objective lens with low-profile bell allow for easy mounting ring selection; most rifles should be able to use a set of standard low rings. Eye relief varies in an easy range of 3.7” to 4.2”, depending on magnification. Field of view is a very respectable 34.6 feet at 3x magnification, and 14.6 feet at 9x. All of these features along with Leupold’s stellar customer support and industry reputation ensure that this scope is an excellent choice for any hunter or shooter. Though the price is about average for a scope in this category, the VX-II 3-9x40mm offers a lot of value for the money. It’s a class-leading scope with features and rugged reliability to match, ensuring many years of solid service.